Teena was away in Jamaica this week on vacation with her sister, Sarah, and when she returned she had two cans of Red Stripe Lager in her suitcase. I know what you're thinking ... we can get it here. Yes, we can. The problem is that it's transported by ship, then rail or truck, passing through customs twice along the way, only to sit in a warehouse for a few more days/weeks before being distributed. The beer Teena brought home was brewed, shipped to the hotel, then flown home. Not fresh, but much fresher. The recipe is likely different too, considering the Red Stripe in Canada is 5% apv compared to the 4.7% apv served in Jamaica. What I am trying today's is authentic Red Stripe. 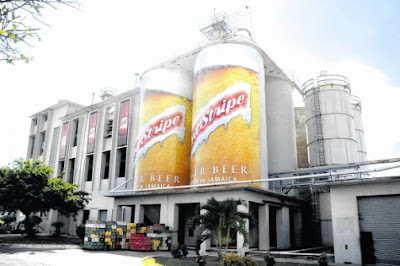 Red Strip is brewed by Desnoes and Geddes Brewery located in Kingston, Jamaica. According to Reference for Business the brewery was formed in 1918 by Eugene Peter Desnoes and Thomas Hargreaves Geddes, who combined their two shops into one business. (According to a 75th anniversary retrospective in the Gleaner, the two had met earlier while Desnoes was employed as a 12-year-old "door opener" at the West Indies Mineral and Table Water Company.) The firm originally made soft drinks, or "aerated and mineral water," according to its prospectus in the Gleaner, but also sold alcoholic beverages shipped in from abroad. D&G was incorporated on July 31, 1918. A notable early product was "Kola Wine." After about nine years, the pair opened the Surrey Brewery in downtown Kingston. The first Red Stripe beer was produced there in 1928. The famous brand was originally applied to an ale, which was too heavy to suit local tastes. The lager version, which would garner worldwide acclaim, was developed in 1938 by Paul H. Geddes, son of the company founder, and Bill Martindale. In 1991, Guinness acquired 51% ownership of D&G. In October, it was announced that Heineken had gained sole control of the company. Red Stripe pours golden in colour, with a white head. The aroma is a little grassy, with some slight hops in aroma. It's a lot lighter tasting than its 4.7% APV suggests. More like a 4% light beer. It's a sweeter tasting lager, that loses its sweetness in the finish. No bitterness here, just a disappearance of the sweet notes. This is a beer that would fit well with a hot Jamaican afternoon, or a hot humid Toronto afternoon like today. And Teena not only brought me home a couple of cans of Red Stripe ... she also bought me the tee-shirt!